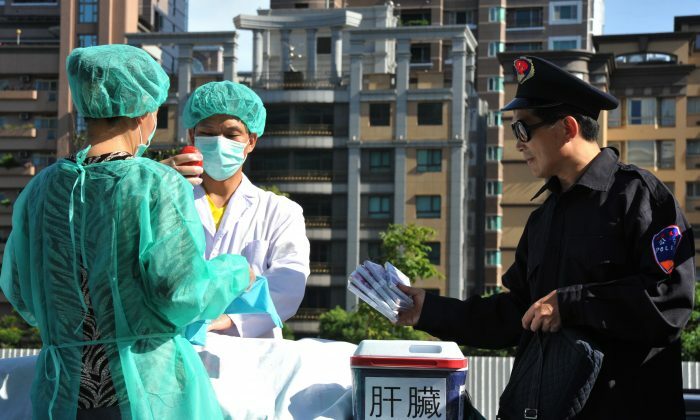 Taiwan’s Parliament has made amendments to its organ transplantation law that would have the effect of criminalizing the transplantation of organs from executed prisoners in China, part of a global trend to halt the trafficking of human organs in China. The new amendments place some of the responsibility of regulation on doctors and hospitals. Doctors must file a report for any patient who receives a transplant overseas and carries out follow-up treatment in the country. Both doctors and hospitals are subjected to fines of up to $NT150,000 (about $4,840) if they fail to submit reports. Medical institutions and staff will incur criminal charges for filing false reports. Lee Po-Chang, chairman of Taiwan’s Organ Registry and Sharing Center, said Taiwanese doctors can refer their patients to overseas hospitals that acquire organs via legitimate means. Doctors still need to submit a report on these cases upon their patients’ return. Taiwan’s organ transplant regulations “have reached international standards,” Tien said. After years of denial, China’s former vice minister of health and present Organ Transplantation Committee chief Huang Jiefu admitted that the regime was using organs from death row prisoners in December 2005. According to state media, these organs account for two-thirds of all transplants on the mainland. The regime pledged to eventually stop the practice, but only confirmed the move in December 2014. Huang said that only organs donated voluntarily from civilians will be used in transplants starting January this year. Not everyone is buying the Chinese regime’s claims, however. European officials, doctors, medical researchers, and experts said at a European Parliament workshop in Brussels on April 21 that there are “extrajudicial killings and harvestings of prisoners not sentenced to the death penalty” still taking place in China. Acknowledging the research from independent investigators, participants at the European Parliament condemned the slaughtering of prisoners of conscience, the bulk of whom are practitioners of Falun Gong, a spiritual discipline persecuted in China since 1999. When allegations of forced organ harvesting were made in 2006 by the wife of an organ transplant surgeon, David Matas, a human rights lawyer, and David Kilgour, a former Canadian member of parliament, decided to investigate the seemingly incredible claims. Through anonymous, investigative telephone calls to transplant hospital doctors in China, and by analyzing China’s transplantation statistics and the trade it was doing, Kilgour and Matas drew the conclusion that the Communist Party has been systematically involved in the mass removal of organs from live Falun Gong practitioners in state hospitals for sale to transplant tourists. The duo estimate about 40,000 to 60,000 Falun Gong practitioners have lost their lives in the grisly state-sponsored murder and profiteering. In a separate study, journalist Ethan Gutmann puts the Falun Gong death count at 65,000. In his recently published book “The Slaughter,” Gutmann traces the Party’s organ transplant abuses from its earliest experiments with the Uyghurs, a Turkic minority in the western Chinese province of Xinjiang, to political dissidents and Falun Gong. The organ harvest researchers are featured in “Human Harvest: China’s Illegal Organ Trade,” a documentary, which recently won a Peabody Award, the world’s oldest and most prestigious prize in broadcasting and electronic media. The documentary includes several appearances by Taiwanese citizens who went to China to get organs, and shows their horror upon realizing the actual source of organs used for China’s booming transplantation industry.